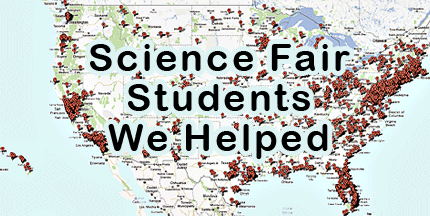 Thousands of parents helped their kids use our School Water Test Kit AnswerPacks for school science projects and science fairs. Our School Water Test Kits helped students successfully complete their school science fair projects since 2001. Kits are ready to use with instructions, QuickCheck test strips and sterile sample containers. Suggestions to Parents helping with School Science Fair Projects. 2015 – 2016 Science Fair Project Ideas using School Water Test Kit AnswerPacks. Most Popular School Water Test Kits chosen by Parents and Students from all grade levels. School environmental water test kits for studying earth sciences, outdoor water quality and environmental projects. School drinking water test kits for studying drinking water and related uses of water. Advanced school water test kits for more in depth testing projects. Please Contact Us about science fair projects involving drinking water – health – food – plants – environment – water quality. FREE Science Fair Checklist helpful for Elementary, Middle & High School student science fair projects.